There was a moment, as I watched Selma, when I became transfixed. 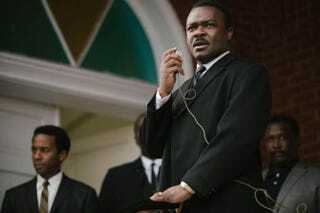 I was fully immersed in the commanding yet nuanced performance of David Oyelowo as Martin Luther King Jr. It wasn’t because the actor looked just like MLK—he doesn’t—or because he perfectly mimicked the cadences of King’s distinctive speaking style. He didn’t seem to attempt to do that. It was because I could, in Oyelowo’s portrayal, see past the mythology and feel the burden—the weight—that King bore as a flawed and fully human man leading an extraordinary movement against a world full of angry opponents. Oftentimes, when we as a nation remember King, we forget the stakes. We see change as inevitable. After all, segregation and voter disfranchisement were wrong, so surely they had to be overturned. We see generational problems solved after movement heroes marched, and we see the rhetorical power of the “I Have a Dream” speech. But we often forget the danger: the shootings that gunned down leaders in their driveways, the pipe bombs shoved under the front porches, the dynamite that was used to blow up a church during Sunday school, and the bodies thrown in rivers and buried in earthen dams. Worse yet, many of us have never considered the toll that the movement took on the people who made it happen. We never bother to think about costs. Few know that Rosa Parks had to leave Montgomery, Ala., after the bus boycott because of threats on her life. Most never consider that Fannie Lou Hamer could never return to her lifelong home simply because she had attempted to register to vote. And most of us fail to imagine the toll that King’s leadership of the Southern Christian Leadership Conference took on his marriage to Coretta Scott King, or on his time with his children. Selma renders those costs visible. We see the strain on King’s marriage and family when he has to leave, month after month. We are reminded that the threats on his life and his family’s lives were constant, with menacing phone calls coming daily. We are reminded that the FBI considered King a threat, and his every move and every phone call were subject to surveillance—not to keep him safe but to slow his progress. Most strikingly, Oyelowo’s King isn’t always confident. He isn’t always sure he is doing the right thing—not because he questioned his cause, but because he worried about the costs. More than the constant threat on his own life, King worried about those who joined the Selma movement, the old and young, men and women, black and white protesters who were drawn from local communities and faraway states. Those who protested were brutally beaten. Selma’s depiction of “Bloody Sunday” wasn’t filled with gore, but it was harrowing nonetheless. And the film’s audience is forced to consider the cost of the movement that was literally being paid by the black bodies assaulted and broken that day on the Edmund Pettus Bridge. We are forced to see the baton-wielding police, methodically teargassing peaceful protesters and chasing them down as they tried to escape the violence. And in Selma we see King having to consider the costs after the killing of Jimmie Lee Jackson, a Vietnam veteran, who was shot as he attempted to protect his elderly grandfather and his mother from an assault by police. Oyelowo’s subtle performance allows us to see the doubt King must have felt as he faced Jackson’s grandfather. After all, it was King’s call to march that had put Jackson in the path of white supremacists, determined to stop any change in their town. But we get a chance to see that King’s strength also came from those who followed him on this dangerous path. In a scene where King has gone to the morgue to comfort Cager Lee, Jackson’s grandfather, we see the scene shift from one of King comforting Lee to a moment when Lee is able to inspire King. Lee, born before the turn of the 20th century, disenfranchised all his adult life, ultimately reminds King why they were there in the first place. So when we see King preaching at Jimmy Lee Jackson’s funeral, we are transfixed. We are swept up with the sense that what is truly incredible in that moment isn’t a fearless leader but a fully human one. So on his holiday, let’s remember the man—encouraged by his faith and the faith of those around him to do remarkable things despite the overwhelming costs.